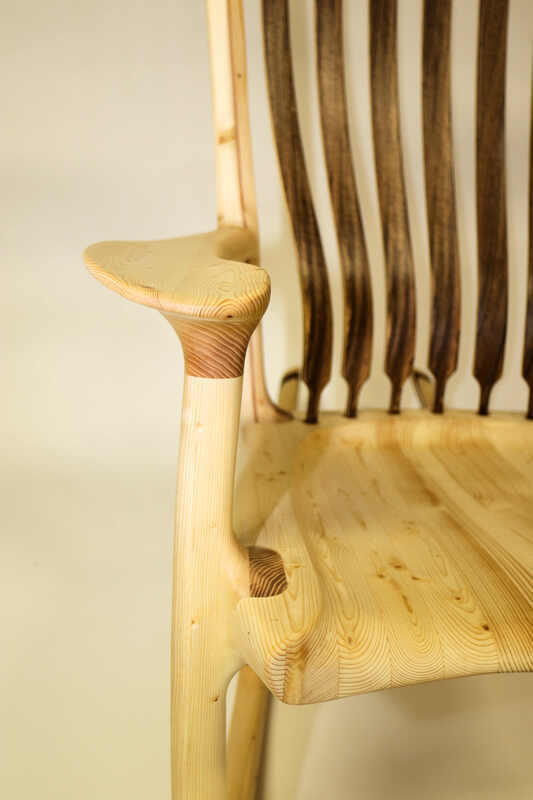 Making the world a more beautiful and peaceful place, one rocking chair at a time. 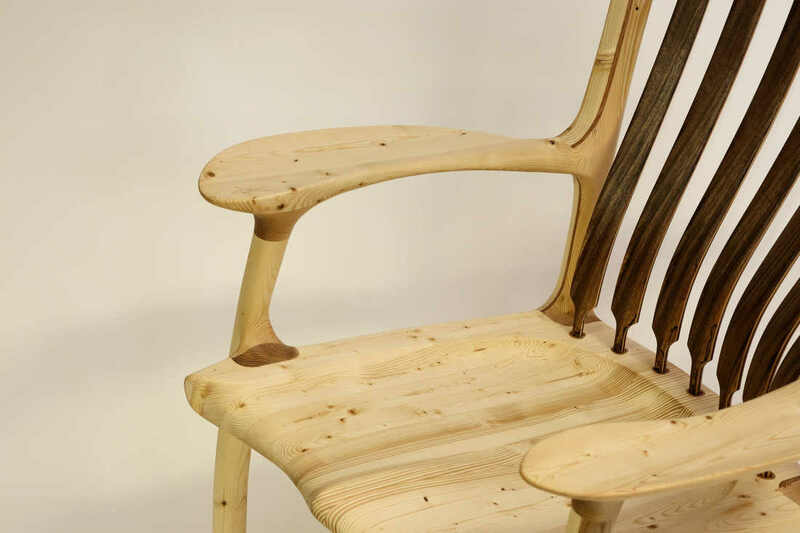 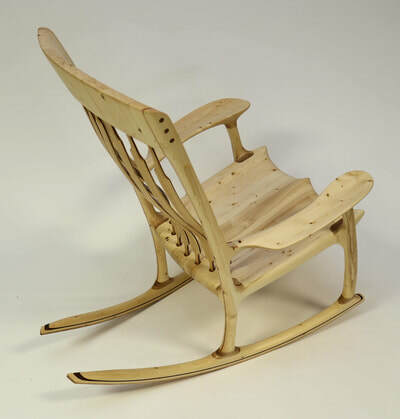 This rocking chair was made from Lowes 2X4s! It has been reinforced with ash where necessary to insure the chair will last for generations! 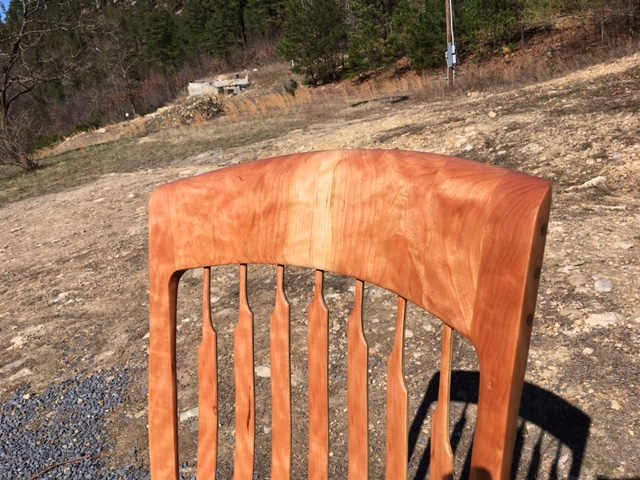 This chair is sold and being delivered to New Jersey in a couple weeks! These are some quick shop photos, I will take some better photos soon! 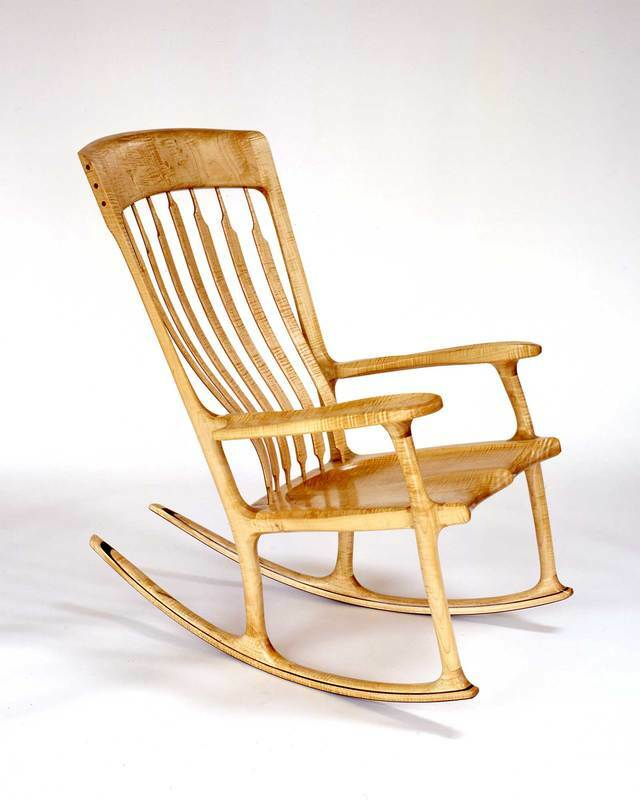 StoryTime Rocking Chair - I invented this chair when our third child, Rose was born and wanted to be a part of the reading crowd very early! 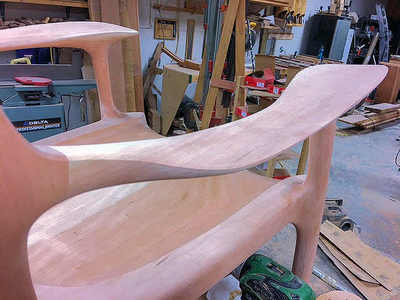 As I did not have a lap large enough for three I had to come up with something! This is the "something" I came up with for reading to my three children. 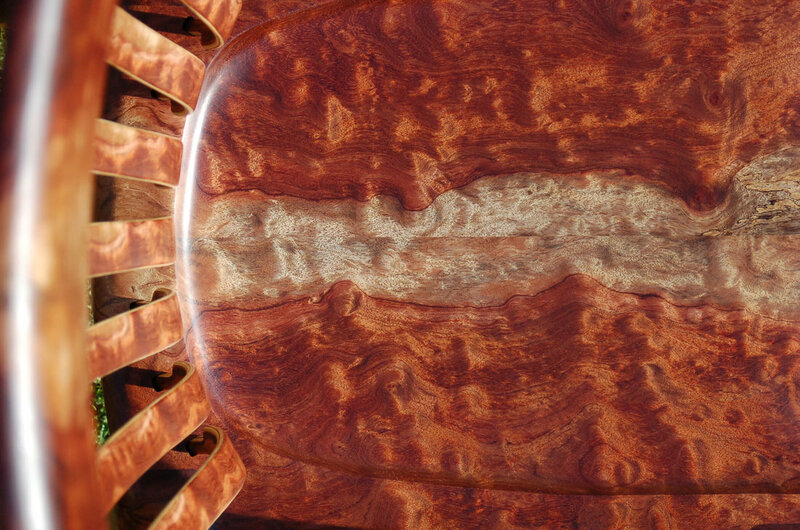 ​royal family in Abu Dhabi. 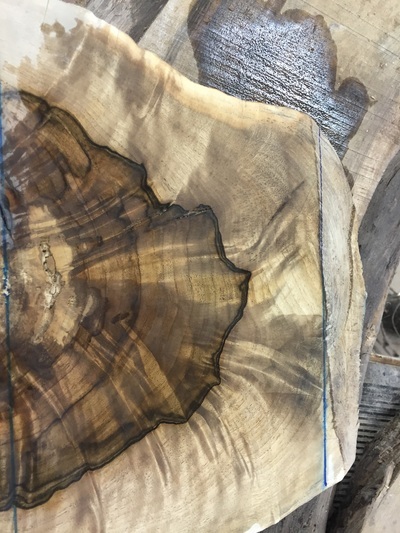 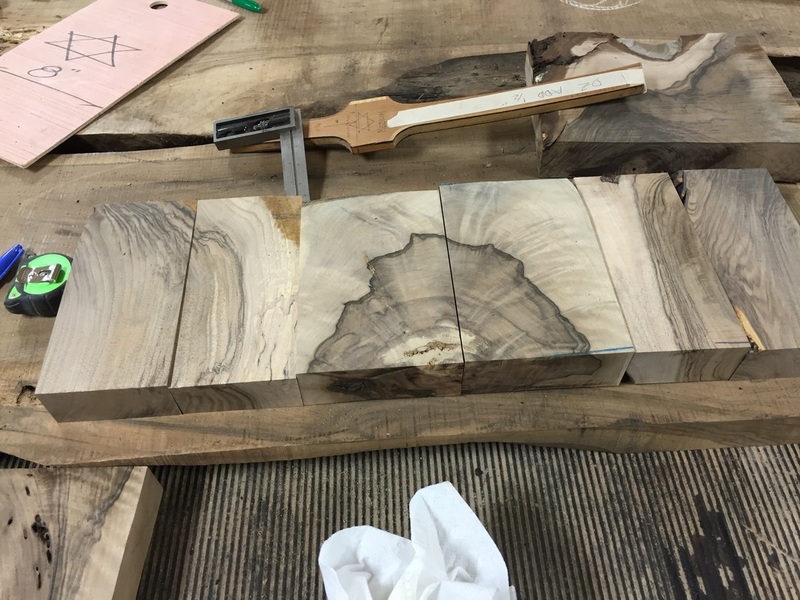 The following photos show a chair I made from a walnut tree harvested from George Washington's Mount Vernon Plantation. 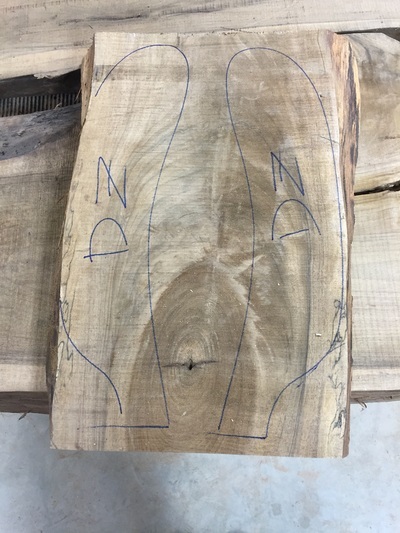 This tree was alive when George was in residence. 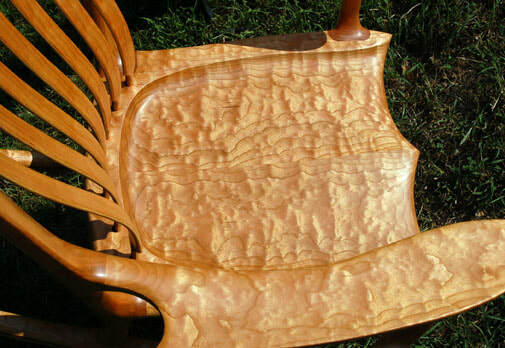 This chair sold for 20,000 dollars. 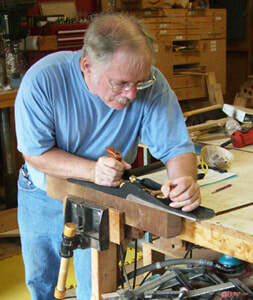 NOTHING leaves my shop unless this fellow is thrilled with it!!! 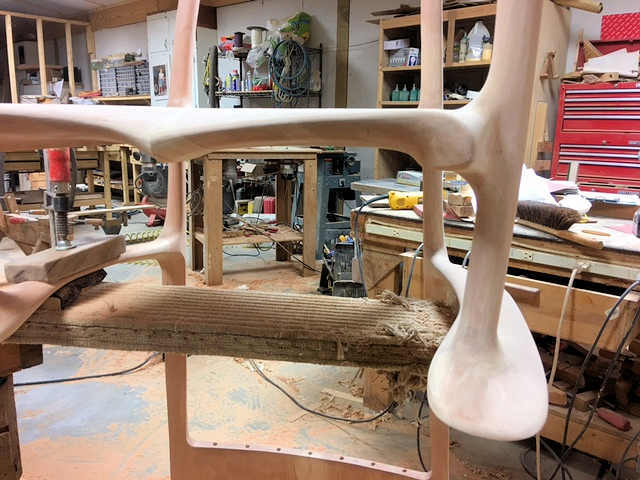 Colin Eden-Eadon, past editor of Britain's premier woodworking magazine, "Furniture and Cabinet Making", said, after sitting in my chair, "It is the most comfortable wooden chair I ever sat in! I have been making rocking chairs since 1993. 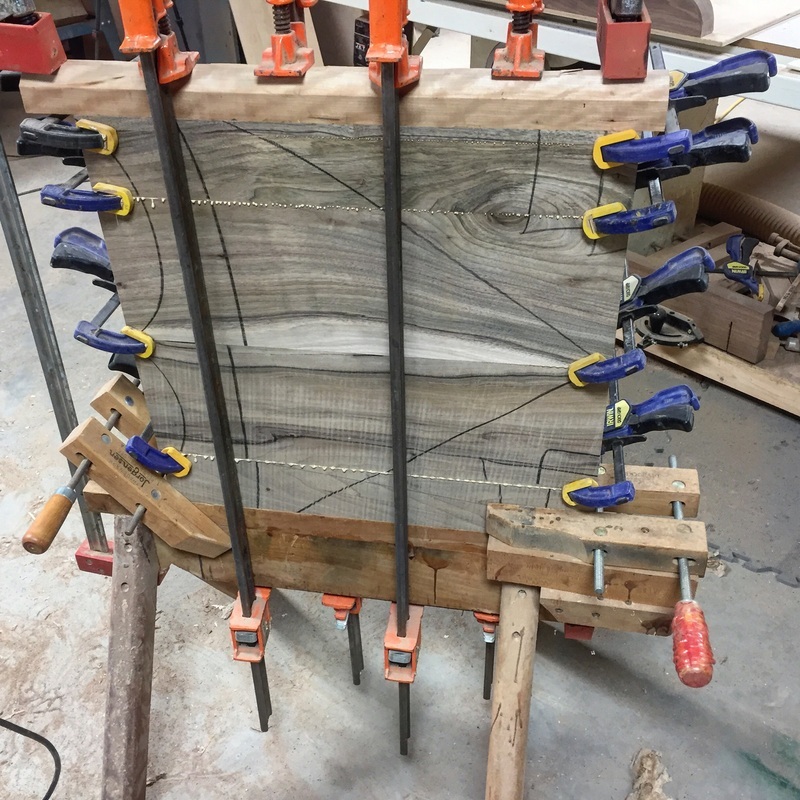 I am not a person that keeps track of time very well. 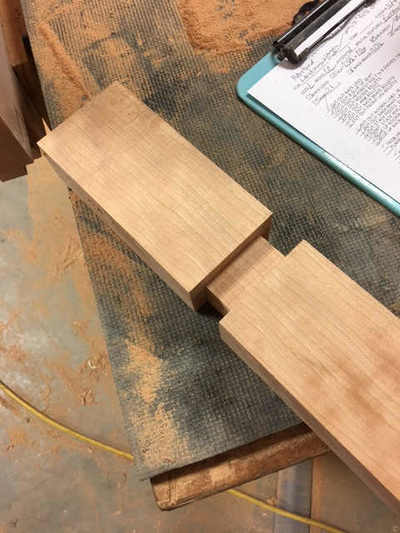 It is not dementia, I was born that way, I have heard from many sources that "Time is an illusion" and it is easy for me to believe. 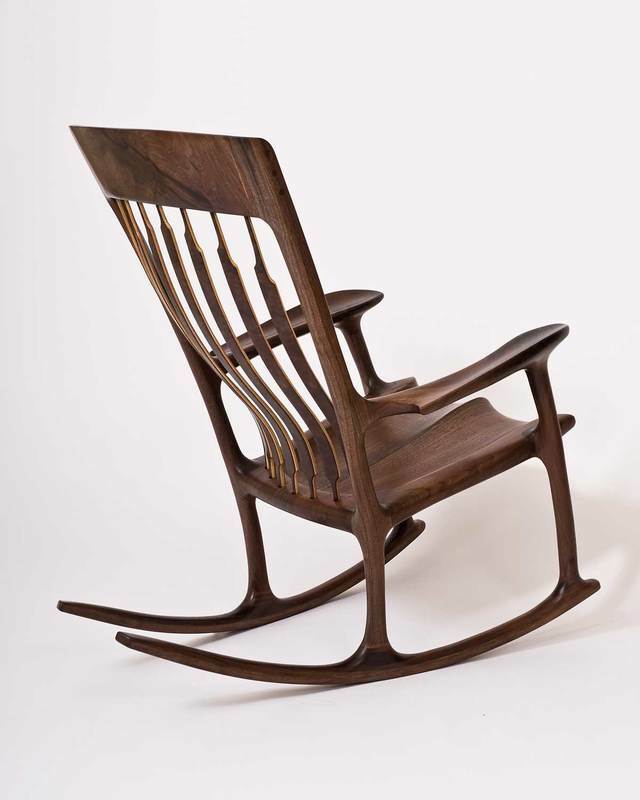 I have dedicated my life, since I started making rocking chairs, to the perfection of their beauty and comfort. 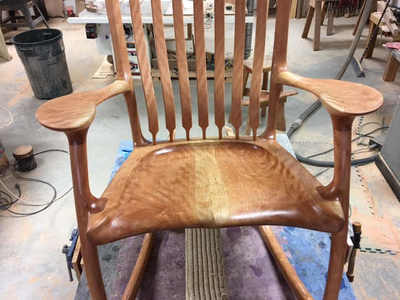 I will not quibble if you believe another's rocker is more beautiful than mine, I might agree with you - BUT - NOBODY makes a more comfortable rocking chair. 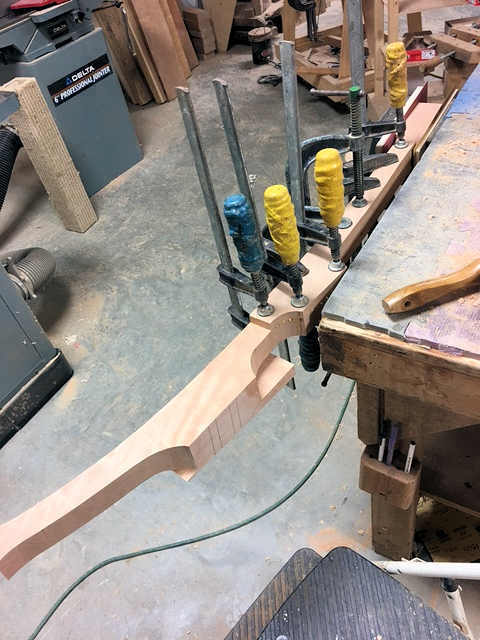 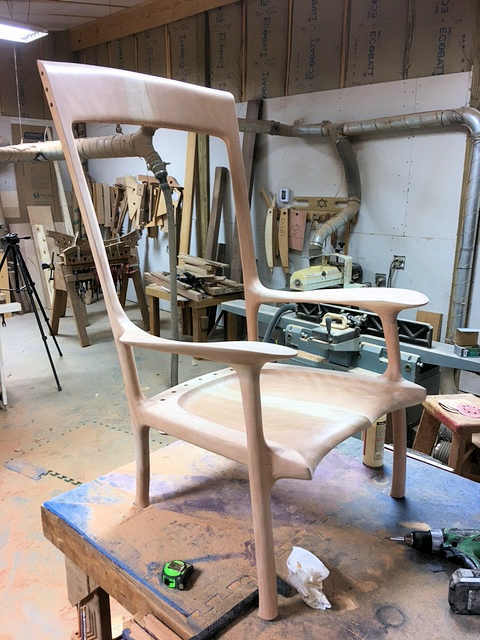 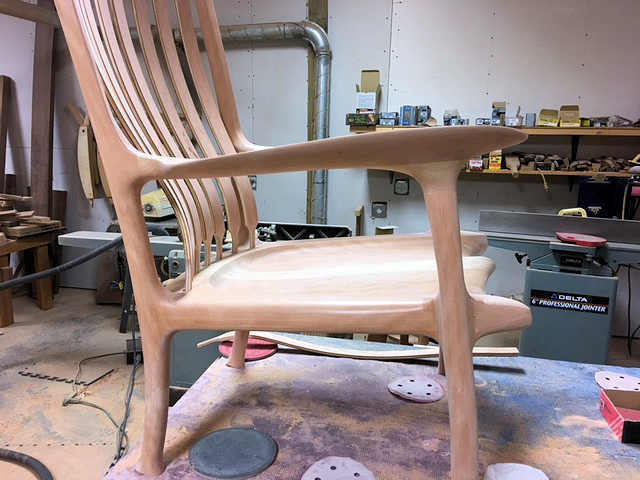 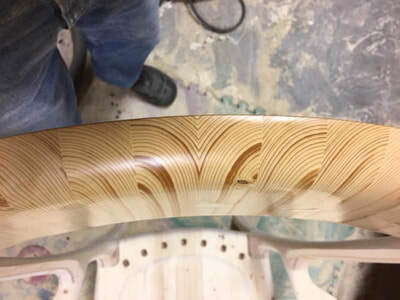 I have, over the years, perfected flexible back braces, the curved vertical grain headrest, a formula for achieving the perfect rocker radius and the perfect fit for each individual. 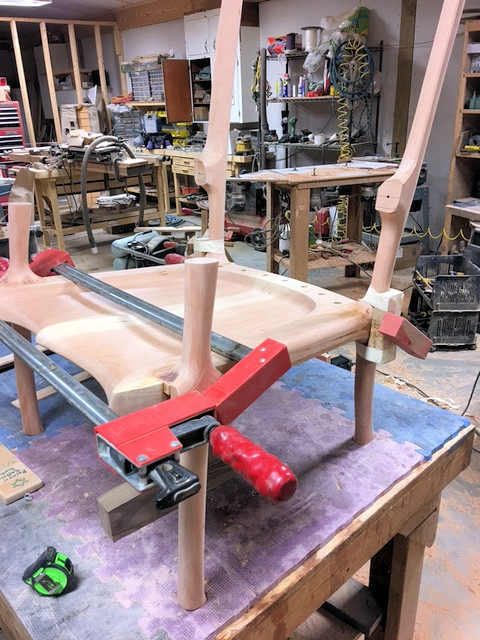 Within a year of making rockers full time I realized flexible back braces were the ticket! All of my students use my flexible back brace system and others who have learned from me now claim to have invented them. If you have questions feel free to drop me a note. 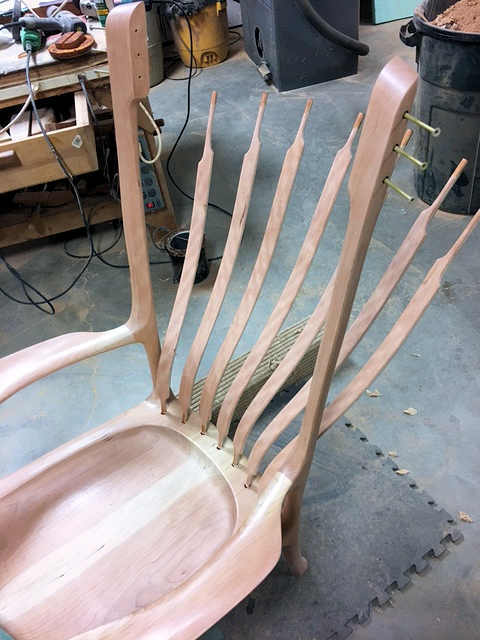 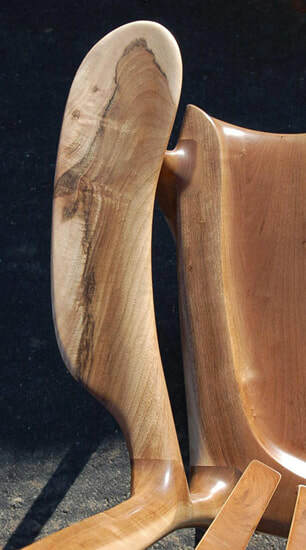 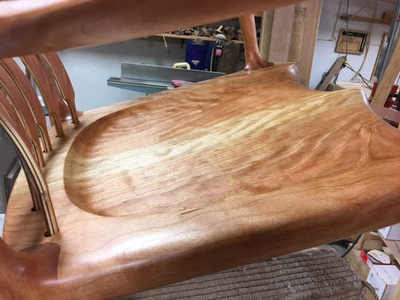 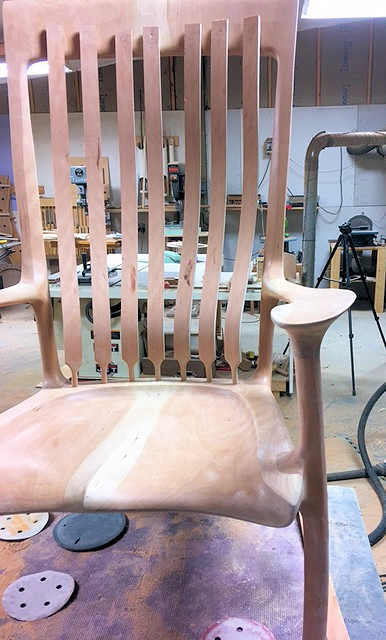 Flexible back braces: The first rocking chairs I made for sale, 25 years ago had flexible back braces. 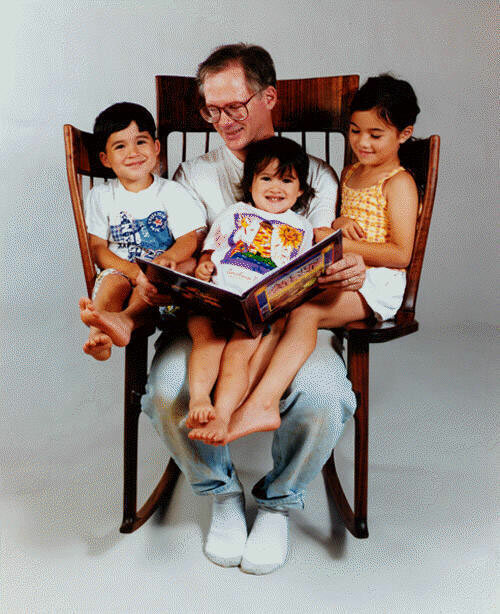 I have been perfecting the flex ever since. 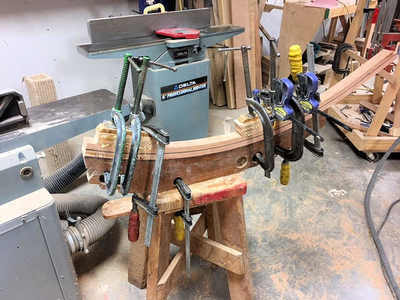 I cut more pieces of wood for my back braces than most people use in four or five completed rocking chairs! 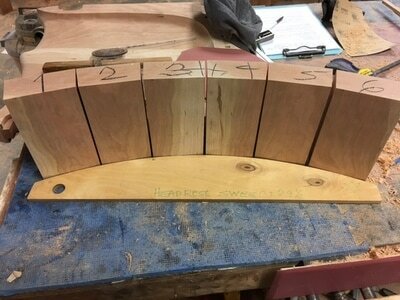 In order to make a set for one chair I cut 72 separate pieces of wood - Each back brace has four full length laminations and there are five precisely tapered wedge shaped pieces of wood which, when incorporated, make the back brace stiffness distinctly non linear, providing flex where they should flex and superior strength where they need to be strong. 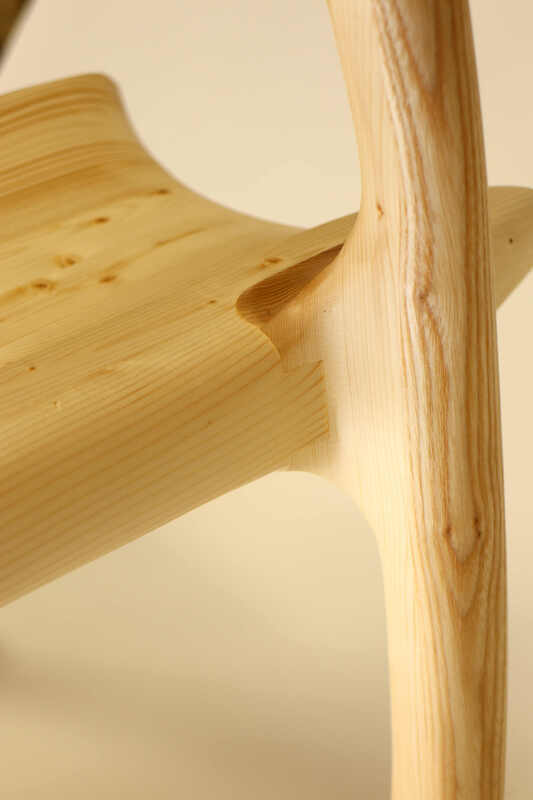 Check out the section on "Comfort" to learn more. 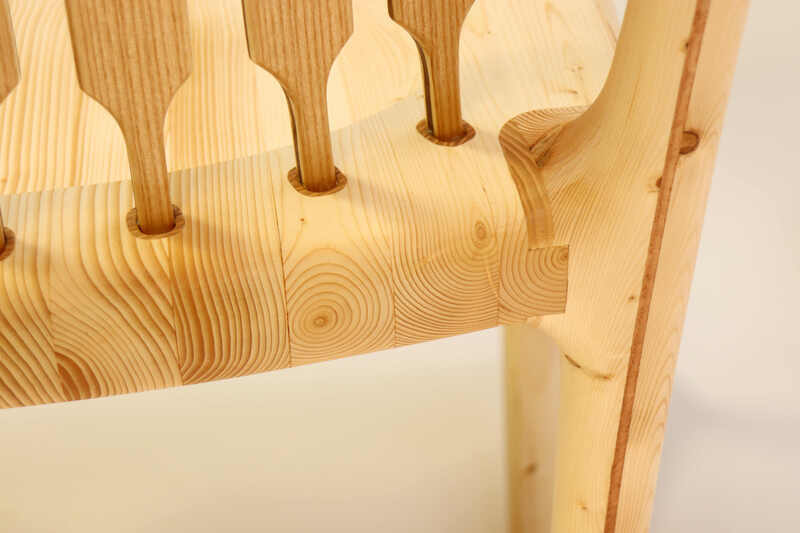 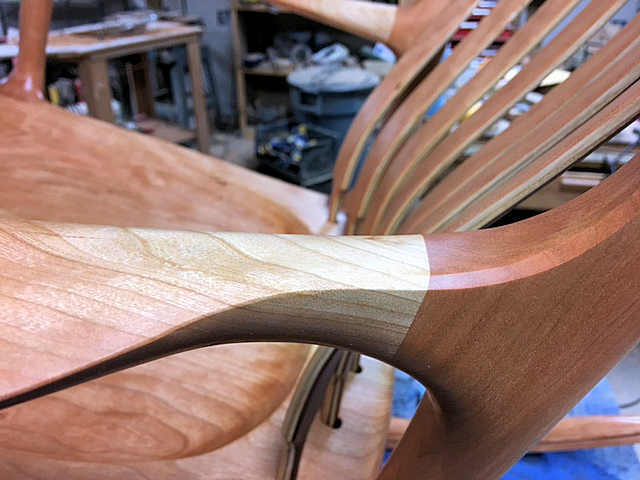 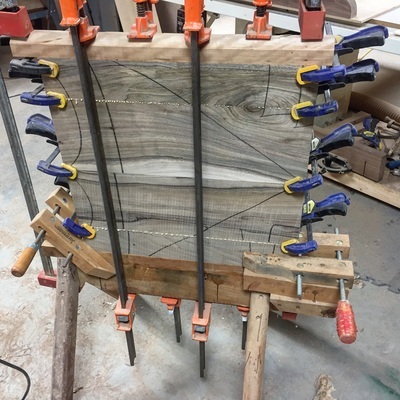 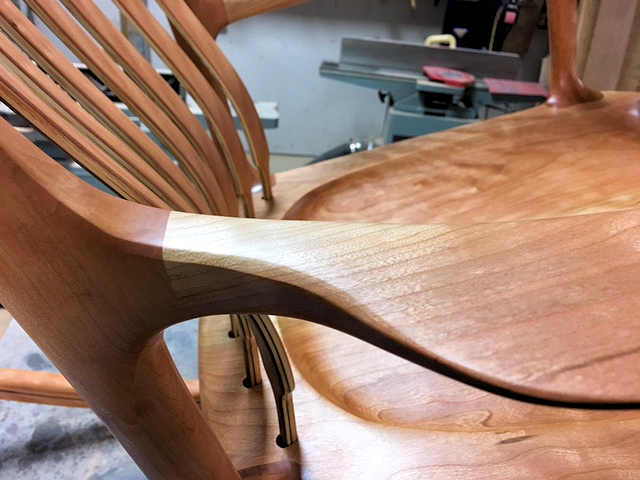 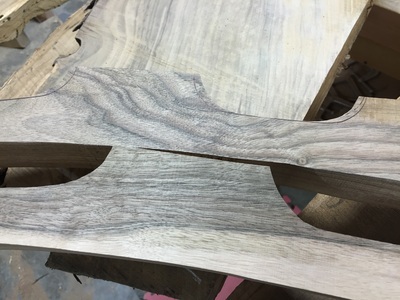 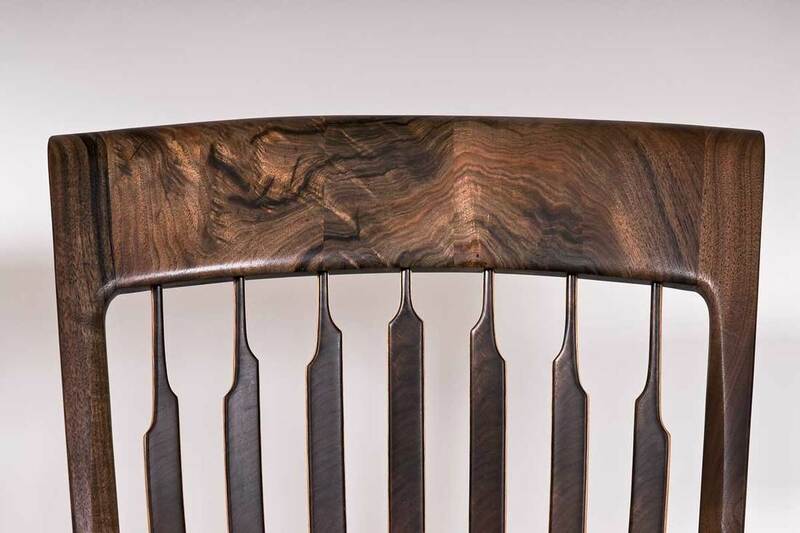 Bilateral symmetry: Following the example of the brilliant cabinet maker, James Krenov, I take care to arrange the wood in my chairs in such a manner that the beauty of mother nature is displayed in all it's glory. 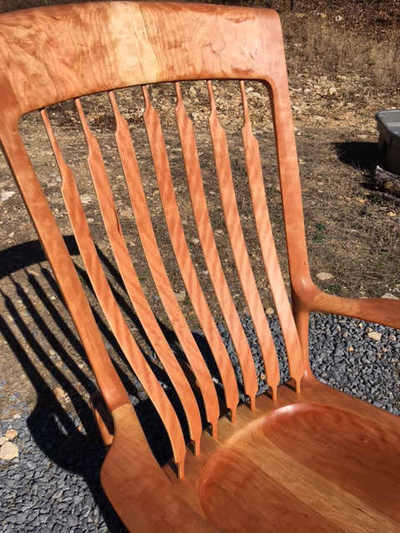 I do this by creating "mirror images" which create a repetition of form inviting the eyes to linger on the beauty of the wood. 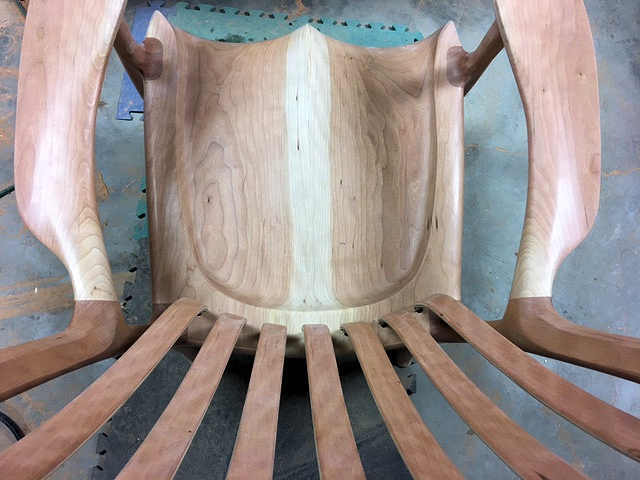 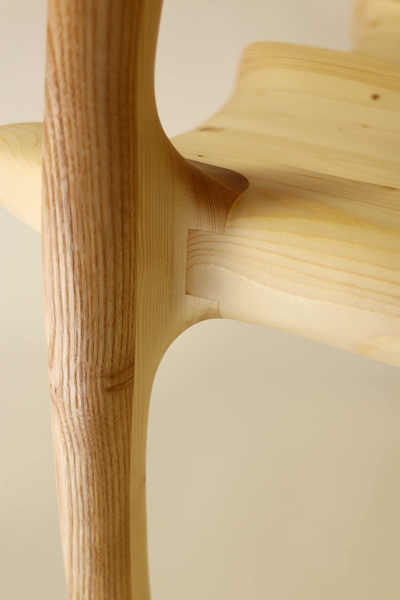 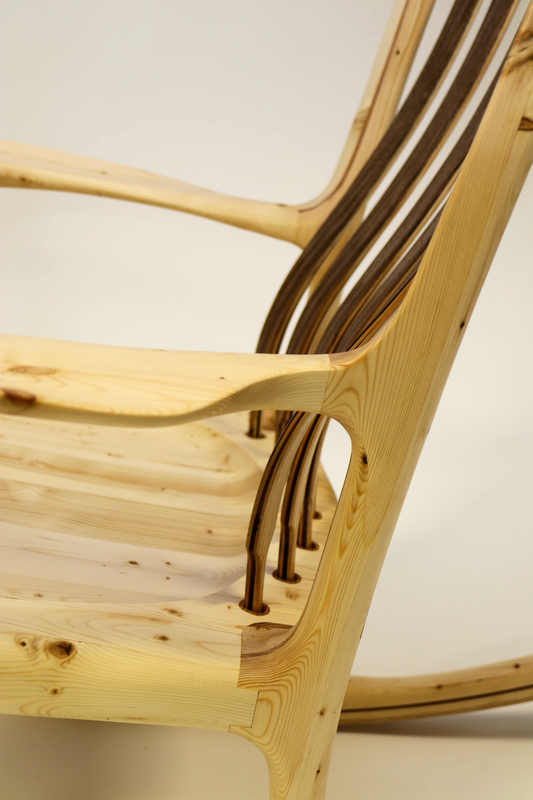 Vertical headrest: When I first started making rocking chairs I used to have dreams that showed me how to make them. 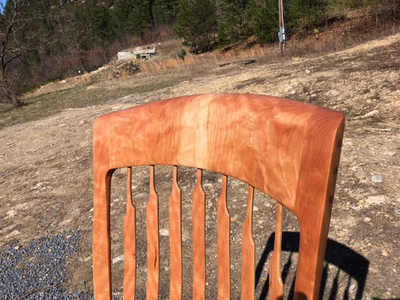 In one dream, when it came to the headrest, instead of the headrest wood being horizontal, as it is in every other chair, I turned it vertical! 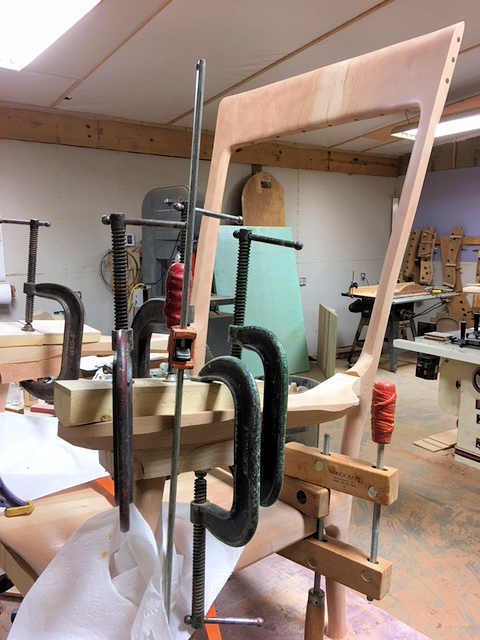 Every chair I have made since has a vertical headrest. 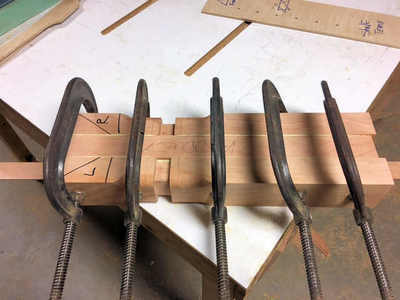 There are many advantages to this method. 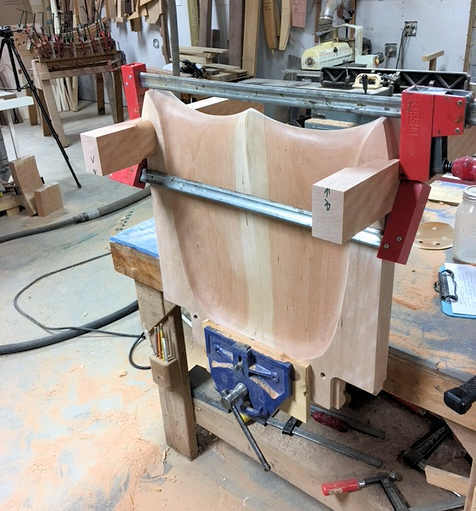 The main advantage is that I can get much more curve in the headrest which means the back braces are in a very comfortable curved configuration to hug your back! 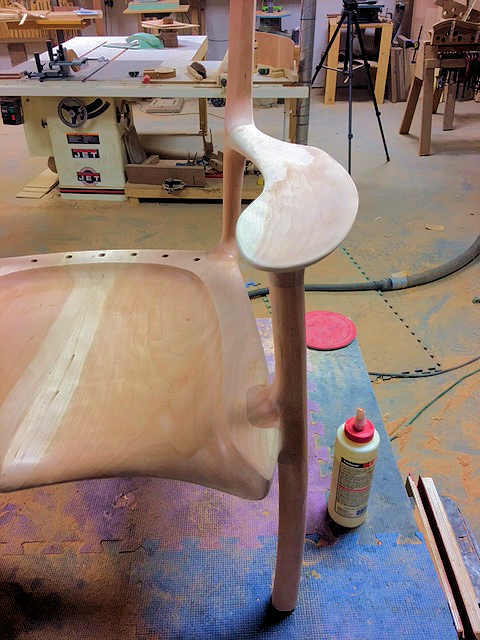 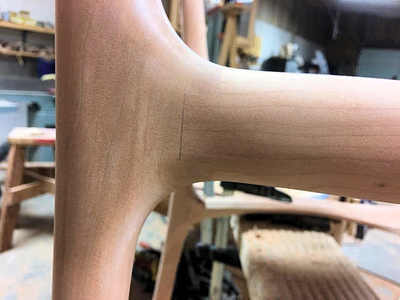 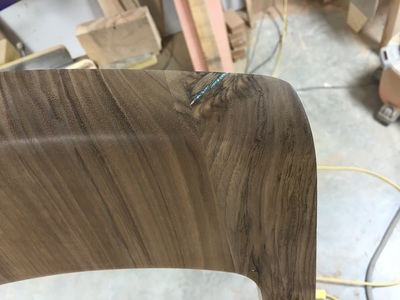 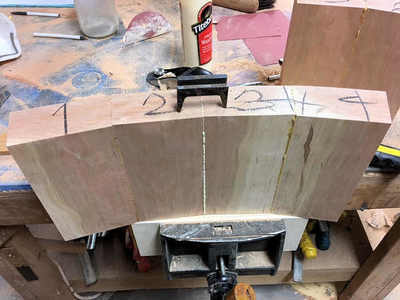 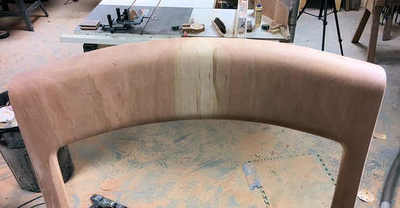 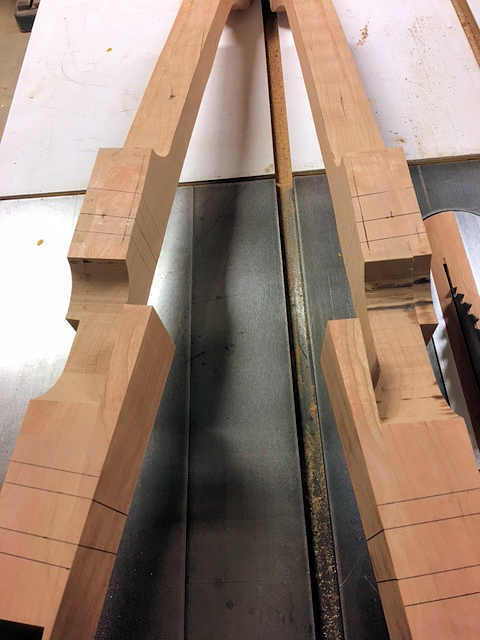 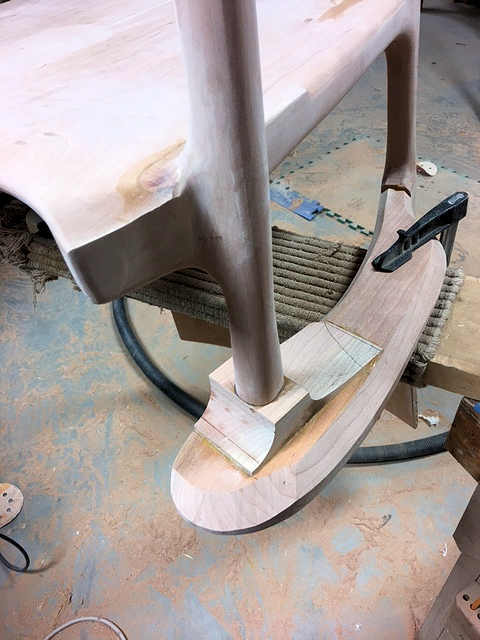 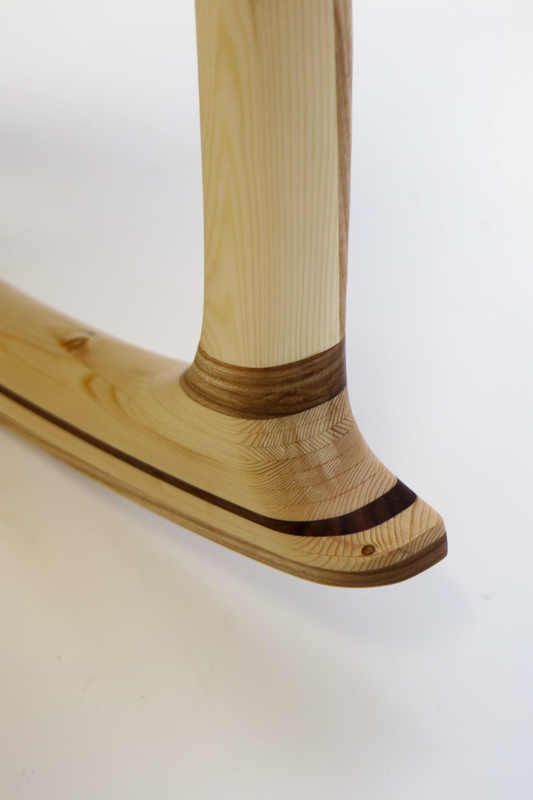 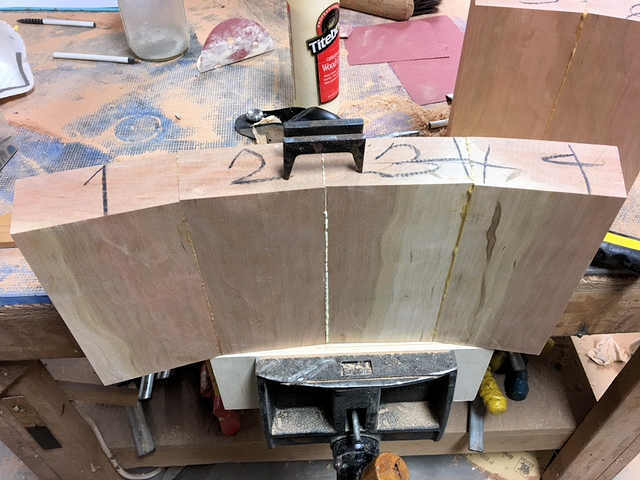 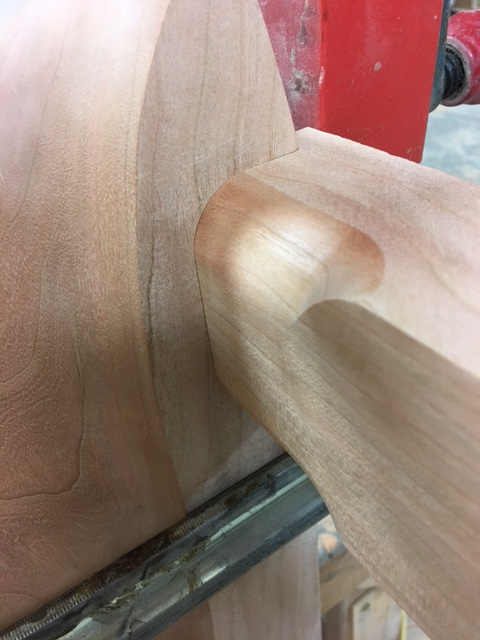 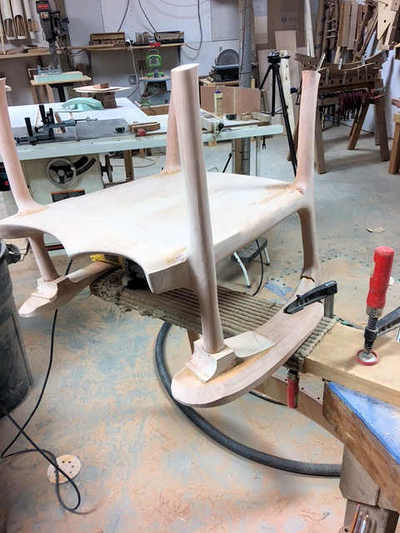 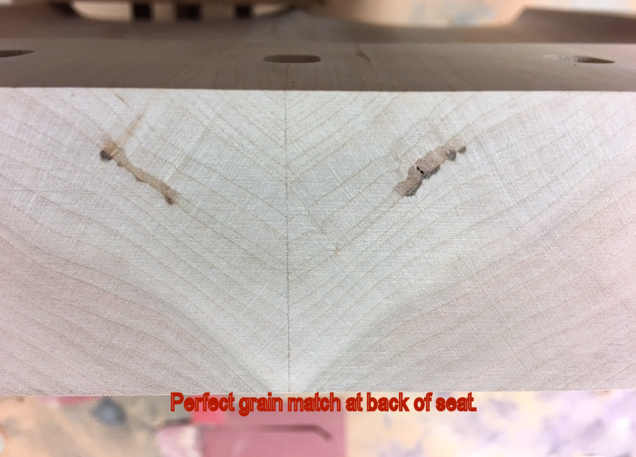 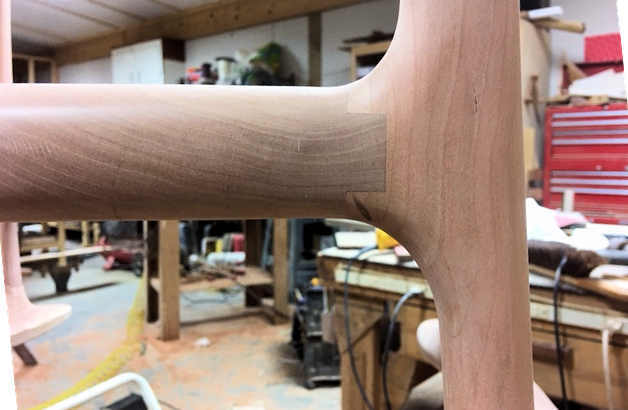 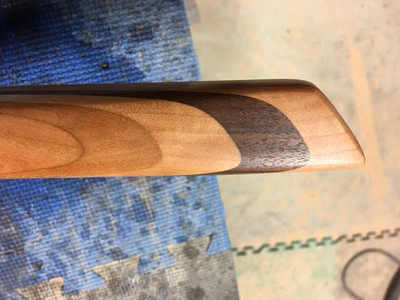 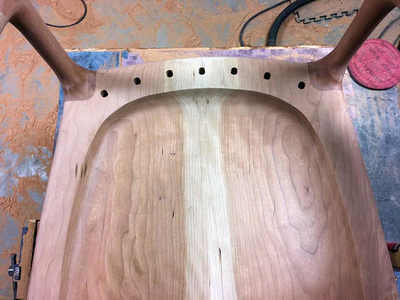 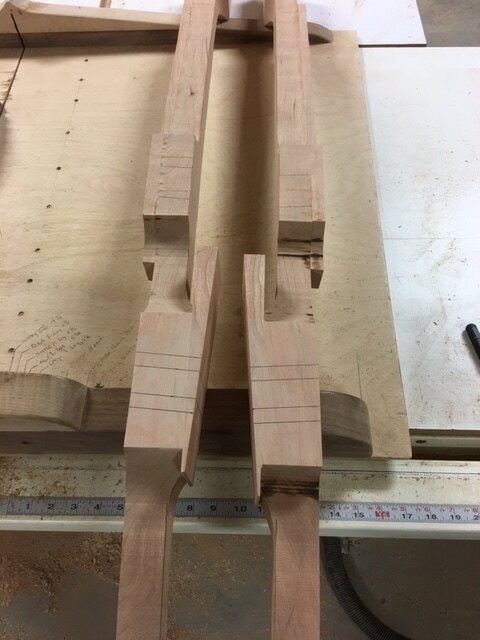 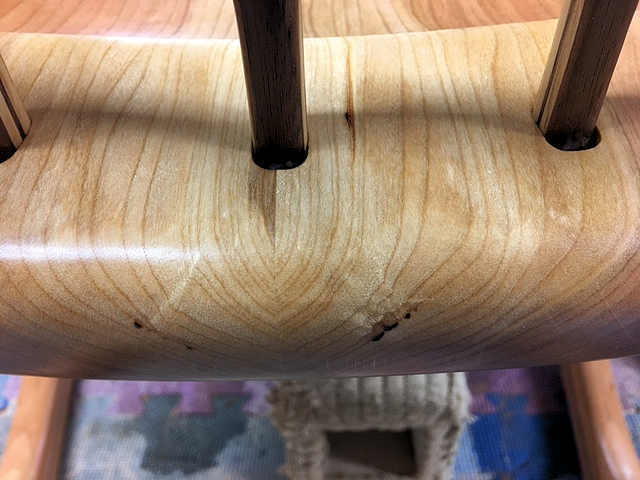 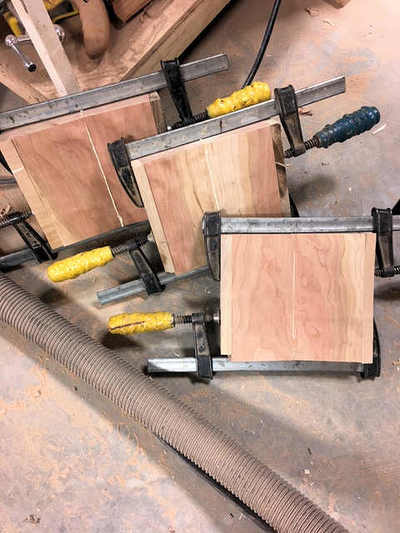 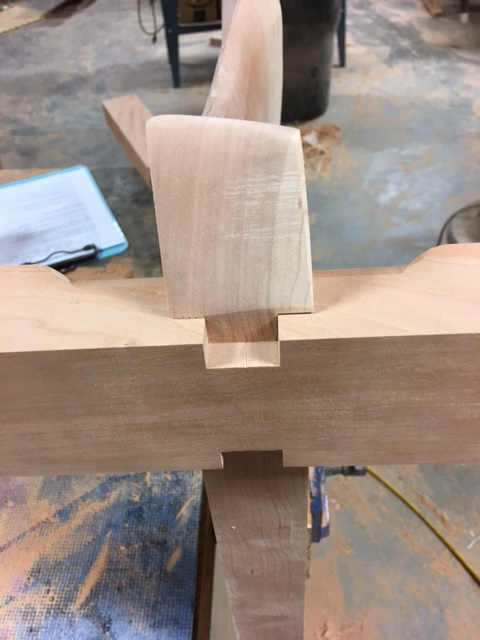 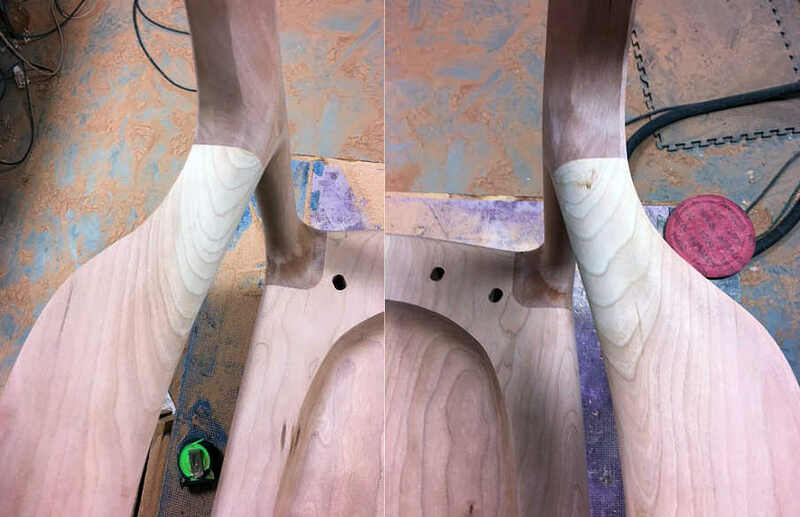 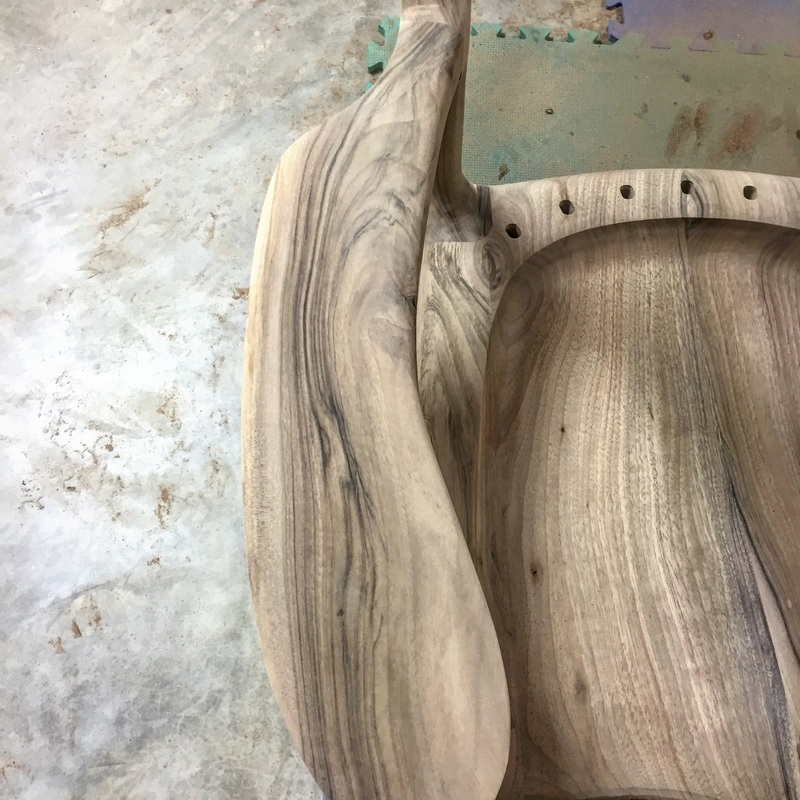 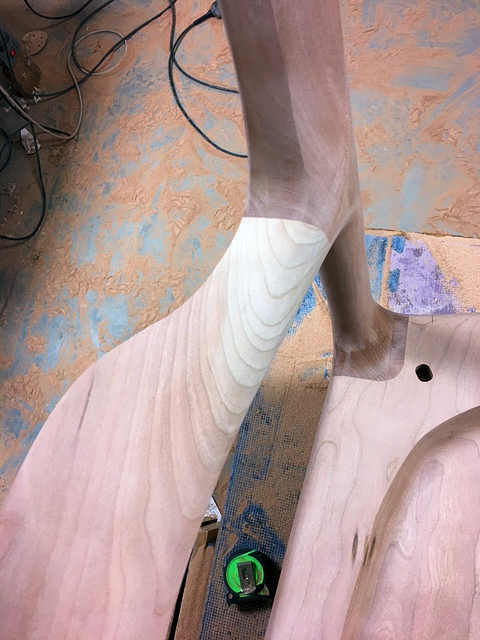 Kerfing the legs after fitting: This allows the legs to be shaped to perfection prior to gluing to the seat, thereby reducing the finish shaping and sanding to a mere fraction of what it could be. Making Rocking Chairs to Fit: Before I started making chairs to fit their new owner most rocking chair makers made one size chair. 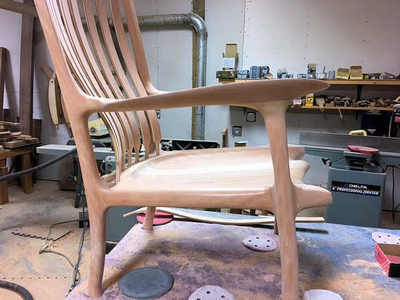 Sam Maloof told me that he only made chairs one size and that was to fit himself. 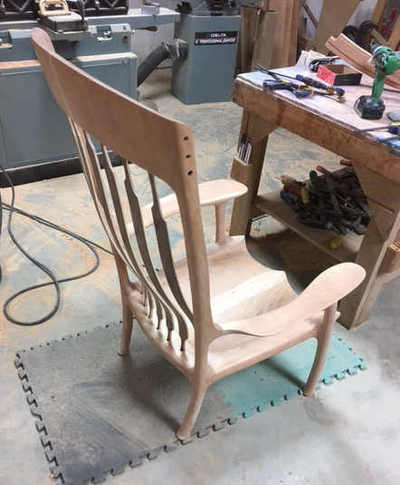 I remember reading web sites where builders explained that rocking chairs were too complicated to attempt to change the size! 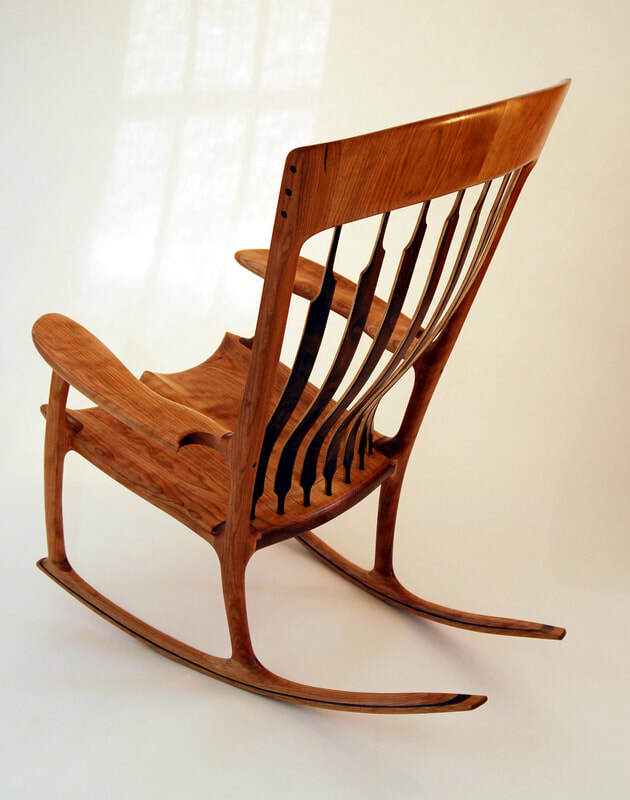 That was 20 years ago, now most rocking chair makers will make to your size. 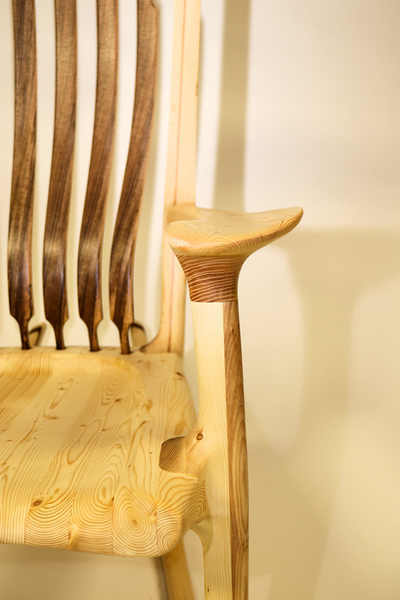 StoryTime Rocking Chair: I created this chair when our third child, Rose, was born and she wanted to be part of the reading crowd very early on. As I did not have a lap large enough for three children I had to come up with something. 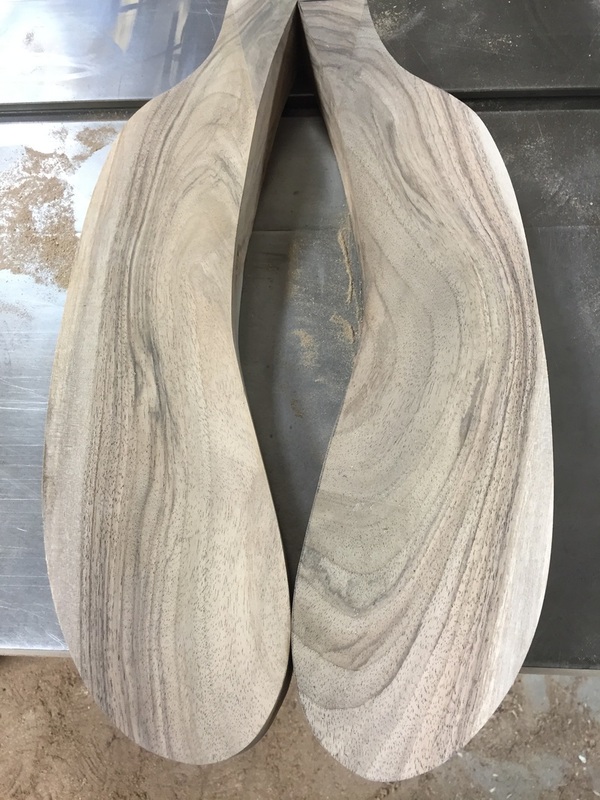 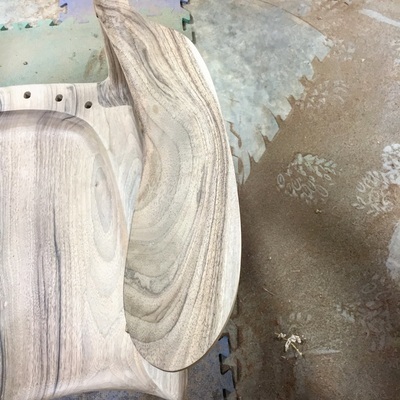 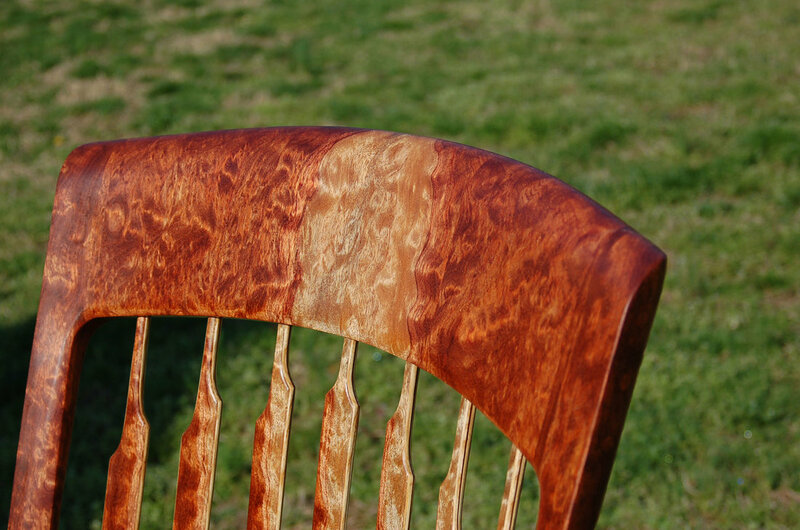 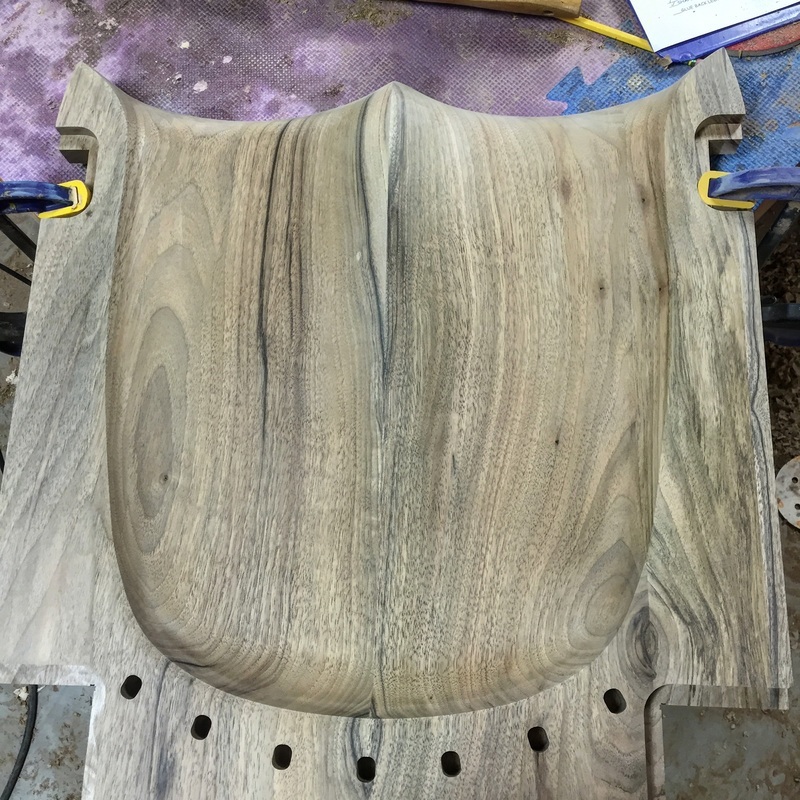 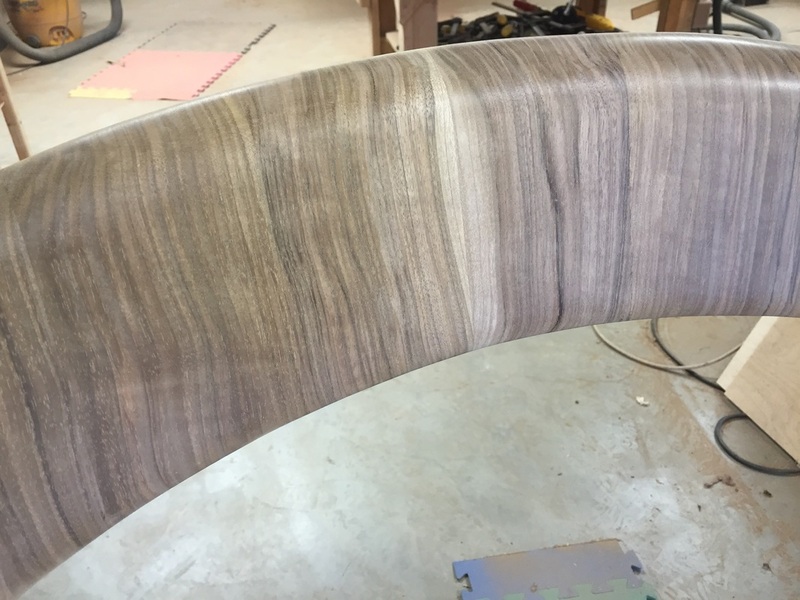 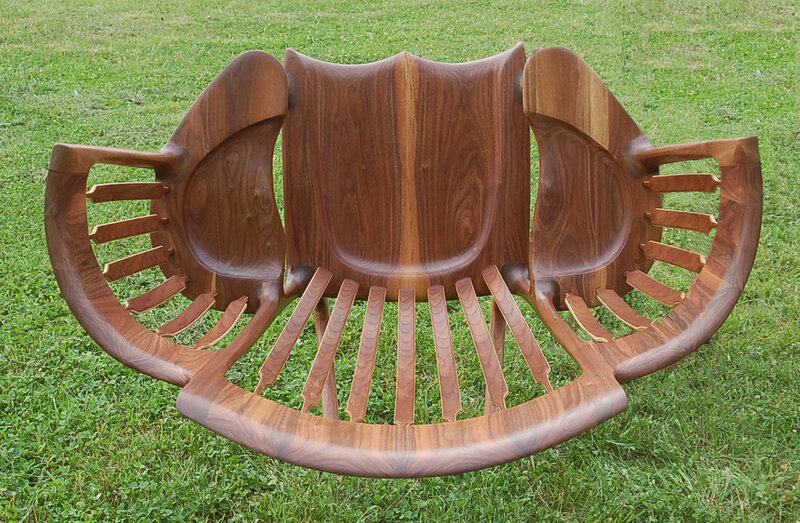 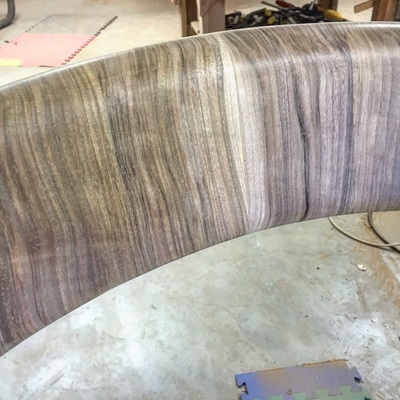 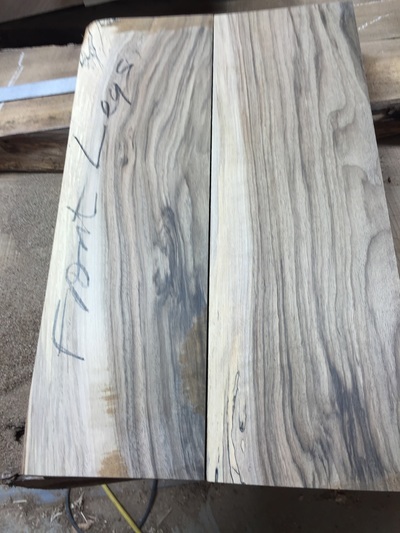 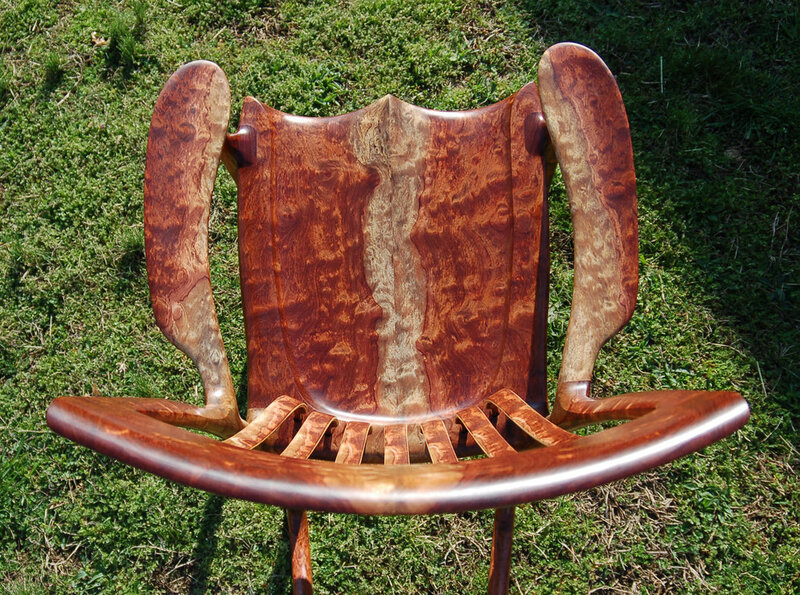 These are photos of chairs being made from my current batch of English walnut. 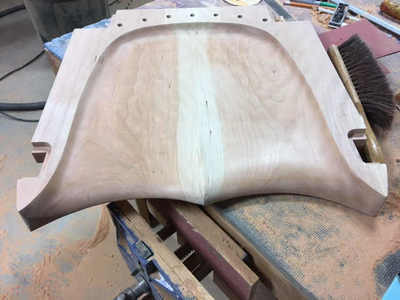 I have enough EW for probably 6 chairs and I have orders for 4 so if you are interested in one I would not wait too long. It took me two years to find this batch!